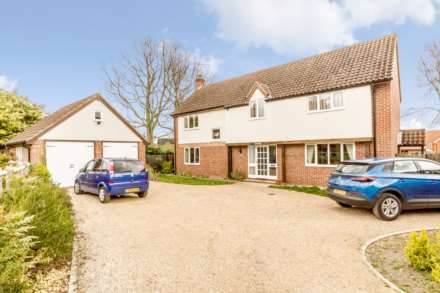 £380,000 to £400,000 Situated within the Norfolk village of Hilborough, Longsons are delighted to bring to the market this well presented four bedroom detached house with double garage. This superb property boasts kitchen/diner, utility room, paddock, countryside views to rear, gardens, three WC`s, parking for several vehicles, UPVC double glazing and oil central heating. Briefly the property comprises entrance hall, lounge, kitchen/diner, utility room, two cloakrooms with WC`s, four bedrooms, bathroom, double garage, gardens, paddock to rear, parking for several vehicles, oil central heating and UPVC double glazing. The village of Hilborough is situated approx. 25 miles from the City of Norwich and only approx. 5.5 miles from the bustling market town of Swaffham with a range of local amenities including Waitrose suprermarket, local shops, pubs and restaurants together with a variety of leisure and sports activities including an excellent Golf Club. There are a number of primary schools in the local area as well as Methwold High School, Litcham High School and Swaffham Hamond`s High School. Double glazed composite entrance door to front, stairs to first floor, under stairs storage cupboard, fitted coat cupboard, tiles to floor, radiator. Double aspect glazing with UPVC double glazed windows to front and rear, two radiators. Fitted kitchen units to floor, work surface over, stainless steel one and half bowl sink unit with mixer tap and drainer, integral electric oven with integral ceramic hob and extractor hood over, double aspect glazing with UPVC double glazed windows to front and side, tiles to floor, two radiators. Fitted kitchen units to floor, work surface over, stainless steel sink unit, floor mounted oil central heating boiler, UPVC double glazed window to side, entrance door opening to rear garden, tiles to floor, radiator. Wash basin, concealed cistern WC, Obscure glass UPVC double glazed window to rear, tiled splashback, radiator. WC, tiled splashback, obscure glass UPVC double glazed window to rear. Galleried landing, built in cupboard with double doors housing hot water cylinder, UPVC double glazed window to rear, loft access, radiator. UPVC double glazed window to rear with open countryside views, radiator. Double aspect glazing with UPVC double glazed windows to front and side, radiator. Four piece bathroom suite comprising bath with hand shower attachment, shower cubicle, wash basin set within fitted cabinet, concealed cistern WC, tiled splashback, extractor fan, obscure glass UPVC double glazed window to side, radiator. Two up and over main doors to front, electric lights and power, window to rear. Gated access to front garden with double five bar gates opening to shingle driveway leading to rear parking area and double garage, shrubs and plants to borders, hedge and wooden fence to perimeter. 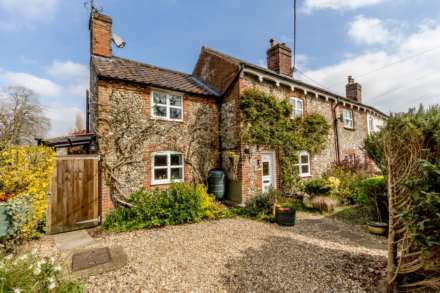 Shingle parking area with vehicular access to double garage, paved patio seating area, garden laid to lawn, double gates opening to paddock area, open countryside outlook to rear.